Cummins Inc. (NYSE: CMI) has performed better than expected over the year despite a more difficult operating environment. The stock’s value has risen by 22% over this period. It has outperformed other engine makers like Caterpillar (NYSE: CAT) which is down 3%, but fallen short of the truck OEMs like Paccar (NASDAQ: PCAR) and Navistar (NYSE: NAV). Management has made strategic decisions that will drive Cummins growth in 2014. 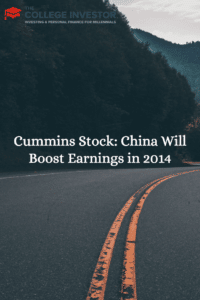 This, combined with an outlook for an increase in North American heavy truck sales of 10% according to ACT in 2014 and the potential from their Chinese JVs, could lead to earnings beating current consensus for 2014, driving the shares higher. We are taking a closer look at the opportunity in China, particularly coming from the NS4 emission standards. This, along with share growth will contribute in a significant way to management’s long-term growth guidance. This is exactly what we were talking about earlier this week with China and American exports. While CMI’s business in China currently accounts for 9% of consolidated Q2 2013 revenue and 4% of JV Q2 2013 revenues, it represents a significant portion of future growth. Cummins has had a presence in China for the past 30 years and is the largest foreign investor in its diesel industry. 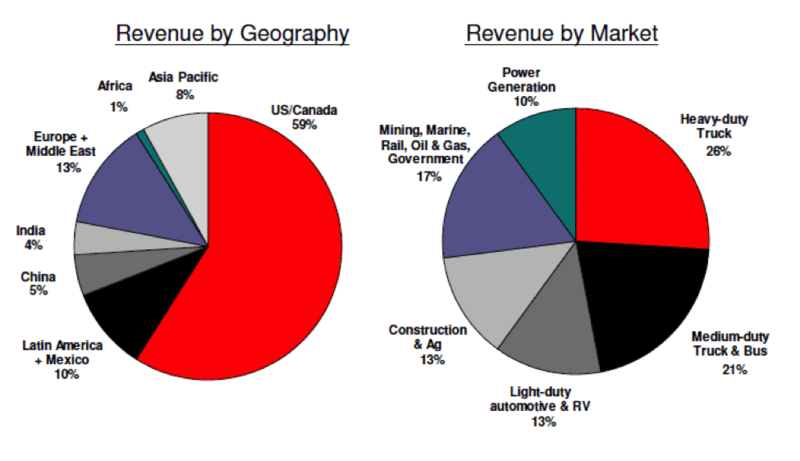 Revenue has grown to $2.6 billion (JVs + consolidated) in 2012 from $200 million in 1994. Consolidated sales at Cummins were $10.7 billion in 2012. It has a market share of just 10% in China of the medium/heavy-duty market. This compares to market shares of 31% in Brazil, 40% in India, 37% in Russia and well over 40% in North America. The diesel engine business stretches far beyond trucks into power generation, construction, and mining. Cummins operates across the spectrum from the lower horsepower, lighter-duty part of the market to high horsepower, heavy-duty applications. It has 17 facilities and over two million engines in service. China is key because it is the largest market in the world for commercial vehicles and construction. These markets have historically grown at 1 to 2x GDP (FY14 forecast of 7 to 7.5%) and management believes Cummins will grow faster than the overall market. Cummins can outpace the market by growing the premium truck and power generation business, expanding further into truck, wheel loader, and excavators among domestic manufactures, growing the components and emission upgrades business and expanding and developing partnerships, which are critical in the Chinese market. Currently Cummins is partnered with Dongfeng Cummins for heavy-duty trucks and after-treatment, LiuGong Cummins for wheel loader and excavators, and Foton Cummins for light-duty and heavy-duty trucks. All the China JVs along with the BFCEC ISF and ISG engines represent a significant opportunity for 2014 in China. 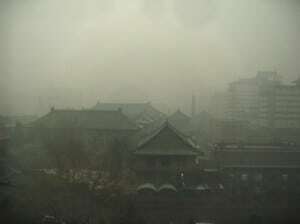 China implemented NS4 emission standards in 2013 to 2014 which could act as the catalyst for significant growth in 2014. There is uncertainty around the level of enforcement of these standards in 2014. The opportunity is significant over the long-term, but growth in 2014 will depend heavily on the stringency of Chinese authorities. Recent commentary does indicate the concern related to pollution continues to increase, so at least a moderate level of enforcement is possible. The size of the NS4 component opportunity through the sales of after-treatment systems is in the range of $150 to $250 million for 2014 based on a moderate level of enforcement, Dongfeng using its systems and some purchases from other truck manufacturers in China. The opportunities for the BFCEC ISF and ISG engines for 2014 is likely in the $100 to $325 million range also dependent on the level of NS4 enforcement. The ISF engine is for light-duty trucks and the ISG is a 10L/12L version that is part of the Foton JV. The ISF has a potential market of 300,000/year in China and will likely cost around $9,000, so the long-term potential is very large. It will be introduced in April of 2014 and should sell around 10,000 units in the year. Last, there is some opportunity to expand its LiuGong business where it is tied to wheel loaders in China. It started to ramp this business up in late 2013, and should continue to increase share in 2014. In addition, forecasts are for the wheel loader market to increase by 10% in 2014. Management is projecting a CAGR of 11 to 18% through 2018 for China which would result in sales in the range of $4.8 to $6.1 billion. 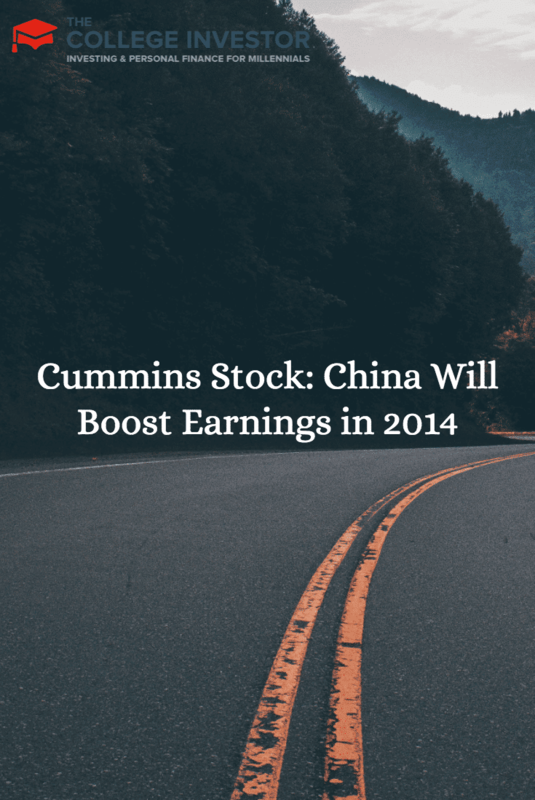 The 2014 opportunity in China could be larger than the Street has currently baked into earnings forecasts. Historically, analysts take a conservative approach with uncertainty in China, particularly those driven by government action such as the enforcement of emission standards. However, with the government focus on pollution, enforcement activity may be greater than expected, driving sales at the upper end of the ranges noted earlier. In addition, its other end market should turn positive and other new agreements, like the one with Navistar, should push sales and earnings higher in 2014. One of my great trades was buying Caterpillar when the White House made a push for more infrastructure spending. Now that China is making the same type of push perhaps it will work out well for Cummins as well. Great insights!